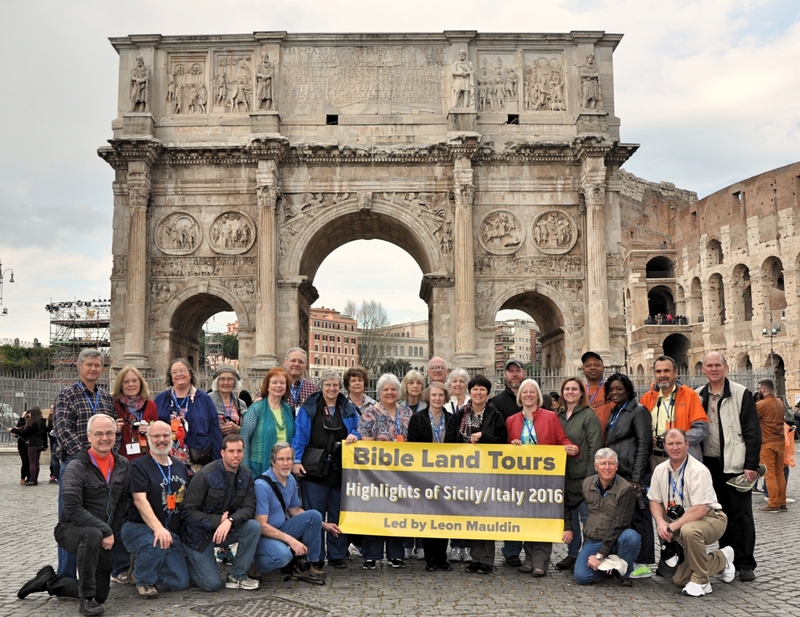 Tonight I thought I’d share a group photo taken today in front of the Arch of Constantine. The Colosseum can be seen at right. Group photo at Colosseum in Rome. There is 3,000 years of history in Rome. More later. Thanks for following our blog. 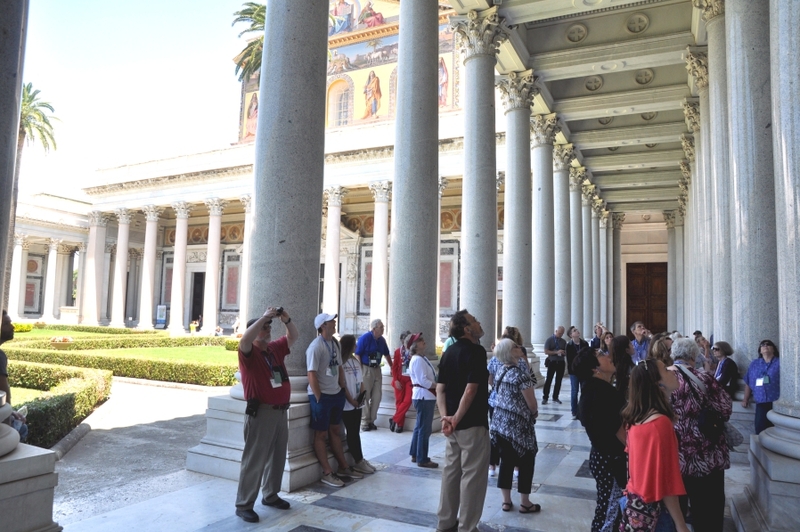 We continue to share some photos and info from our recent trip to Italy. Capitoline Hill, one of the seven hills of Rome, was the citadel of the earliest Romans. The Campdoglio Piazza, created by Michelangelo in 1536-1546, encompasses Capitoline Hill. 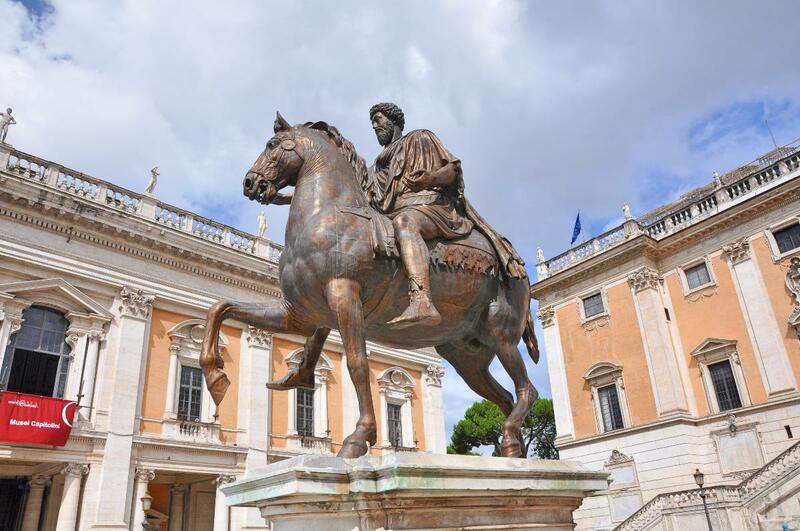 At the center of the piazza is an equestrian (depicting horseback riding) statue of Roman Emperor Marcus Aurelius, (r. AD 161-180). Emperor Marcus Aurelius at Campdoglio Piazza in Rome. Photo by Leon Mauldin. The statue was erected in 175 CE. 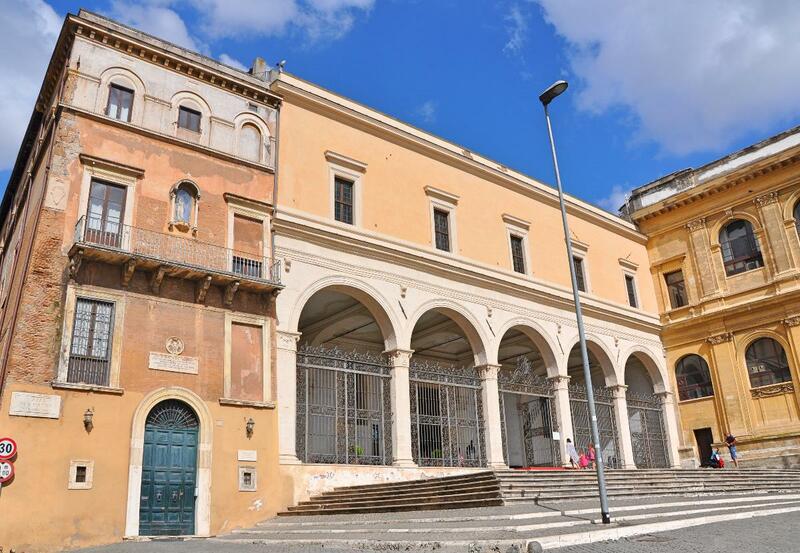 Its original location is debated: the Roman Forum and Piazza Colonna (where the Column of Marcus Aurelius stands) have been proposed. 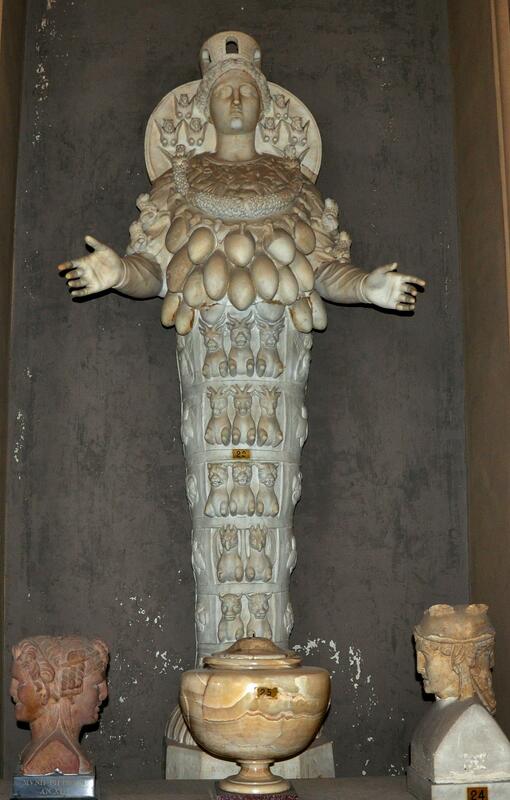 In the medieval era it was one of the few Roman statues to remain on public view. In the 8th century it stood in the Lateran Palace in Rome, from where it was relocated in 1538 to the Piazza del Campidoglio (Capitoline Hill) during Michelangelo’s redesign of the Hill. Though he disagreed with its central positioning, he designed a special pedestal for it. 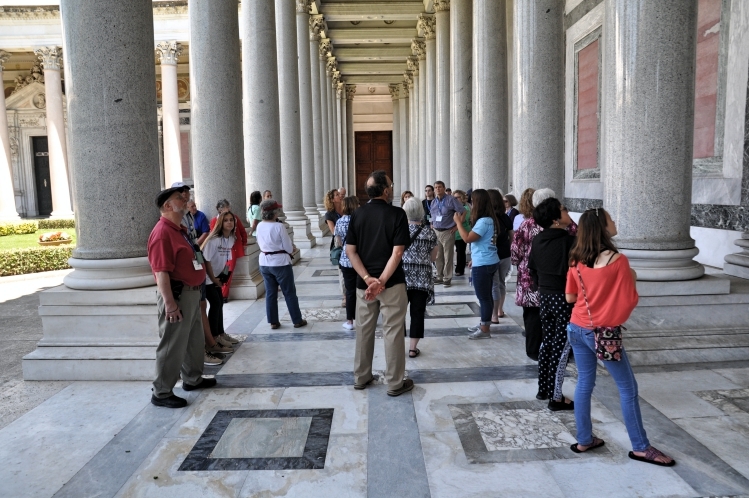 The original is on display in the Palazzo dei Conservatori of the Musei Capitolini, while a replica has replaced it in the square. Piazza Navona is a city square in Rome, Italy, built on the site of the Stadium of Emperor Domitian (AD 81-96). The piazza follows the layout of the open space of the stadium. One of the attractions here is the Fountain of Four Rivers. Fountain of Four Rivers. Photo by Nancy Picogna. Rome’s love affair with fountains goes back to antiquity, whilst the city today can boast a collection of public fountains that has no parallel to any other city in the world! 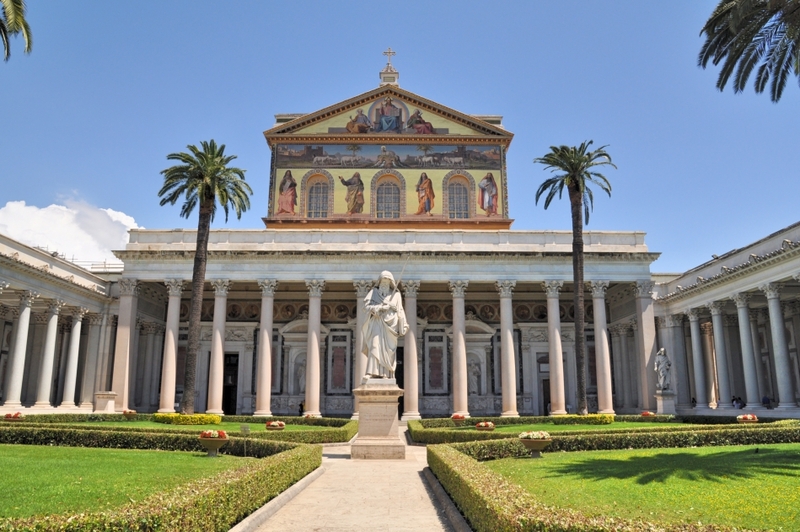 In Baroque Rome, fountains were seen as a reflection of the generosity associated with papal families. The play of water over marble, no matter how humble the design, provided local Romans with entertainments and a much needed, secure supply of water which could easily be carried home. The popes saw this art form as an excellent PR exercise and exploited the concept to the advantage of their standing with the local people. Pope, Innocent X Pamphilj (reigned 1644-1655) eventually commissioned Gian Lorenzo Bernini to sculpt Rome’s greatest achievement in this genre, the Fountain of the Four Rivers, located in Piazza Navona, the ancient stadium of the Emperor Domitian and the site of the Pamphilj family palace. As early as 1647 Innocent had decided to erect an obelisk as a central ornament for the piazza in tandem with a fountain, as he methodically cleaned up and beautified what was one of Rome’s most squalid neighbourhoods! A competition was announced for design submissions by the leading artists of the day, with the exception of the gifted Bernini, who at the time was out of favor because of his close association with the previous papal regime, the Barberini. The Fountain of the Four Rivers depicts gods of the four great rivers in the four continents as then recognized by the Renaissance geographers: the Nile in Africa, the Ganges in Asia, the Danube in Europe and the Río de la Plata in America. 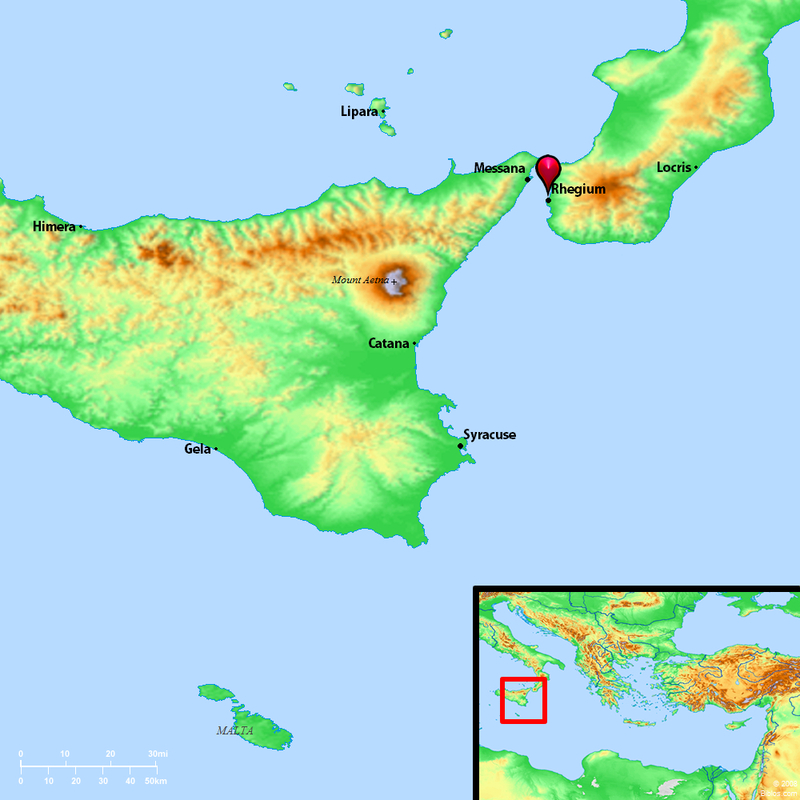 Each location is further enhanced by animals and plants of that country. The Ganges carries a long oar, representing the river’s navigability. The Nile’s head is draped with a loose piece of cloth, meaning that no one at that time knew exactly where the Nile’s source was. The Danube touches the Papal coat of arms, since it is the largest river closest to Rome. And the Río de la Plata is sitting on a pile of coins, a symbol of the riches America might offer to Europe (the word plata means silver in Spanish). 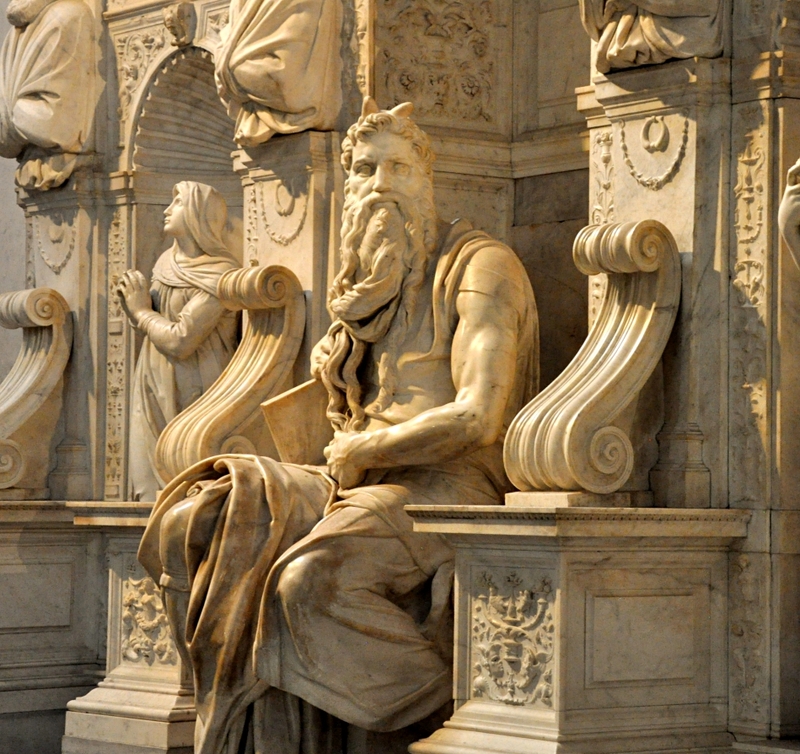 Each River God is semi-prostrate, in awe of the central tower, epitomized by the slender Egyptian obelisk (built for the Roman Serapeum in AD 81), symbolizing Papal power and surmounted by the Pamphilj symbol of the dove. 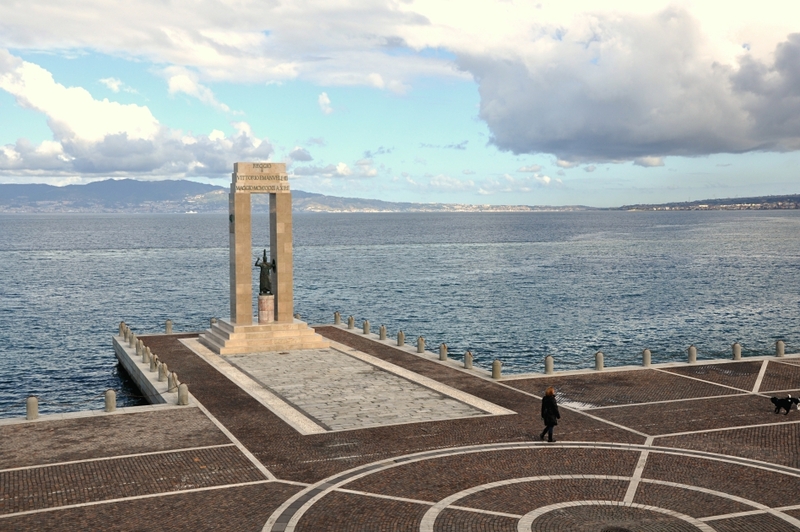 The Fountain of the Four rivers is a theater in the round, whose leading actor is the movement and sound of water splashing over and cascading down a mountain of travertine marble. The masterpiece was finally unveiled to the world on June 12, 1651, to joyous celebration and the inevitable criticisms of the day. 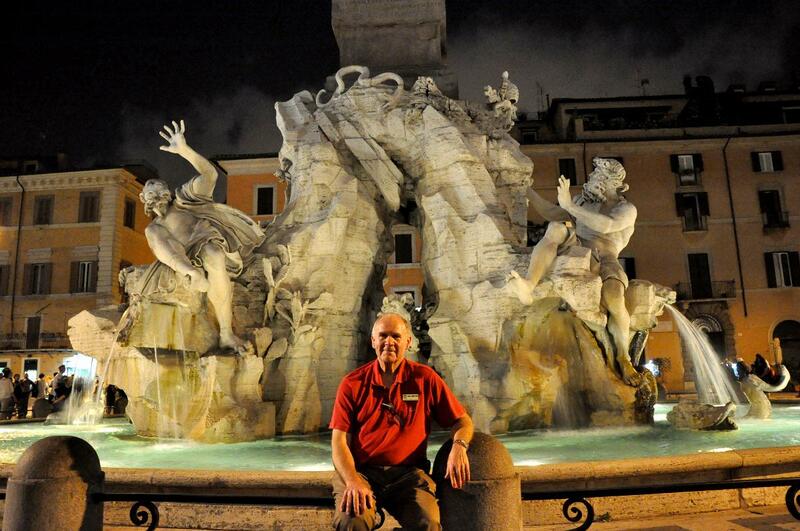 Then as today the Fountain of the Four Rivers continues to amaze and entertain visitors to Rome. Bernini triumphs yet again!